Please accept my thanks and the thanks of my family for your prayers, Masses and charitable donations upon the death of my sister, Pat. Throughout the years, she was a wonderful sister, always supportive and filled with Faith. I am sure it was hard to be the sister of two priests but she never complained and always showed interest in our Parishes and the people we served. For almost forty years, she was a good wife and a great mother of four and a proud grandmother. God was good to her, and she was faithful to Him. May she rest in peace. The Presentation Education Center is almost complete. Final inspections are being done by City agencies and by the architect. The furniture should be arriving any day and the classrooms open for use by the end of the month. A side benefit, now that the building process is completed, is that once again we have parking spaces available in the upper yard for Masses. 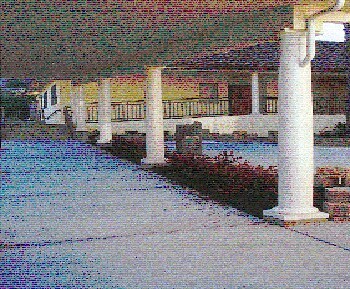 The entryway is between the convent and the school. The formal dedication of the Center will take place on Saturday, May 24th. I hope that all families who helped make this new building possible will make plans to attend. There will be a "Open House" as soon as the final approvals arrive. Again thank you for your prayers for my sister and my family. Today we begin to tackle the questions, "Why do we sing so much at Mass? What happened to the `Low Mass'?" Elements that have suffered injury through accident of history are now, as may seem useful or necessary, to be restored to the vigor they had in the traditions of the Fathers. As a Parish Community, We Pray...For our loved ones who are ill and in pain, especially those who will receive the anointing of the sick today ... May Jesus touch and heal them. We pray for the ill: Marilyn Arancibia, Robert Bacci, Bastiaan Blumenthal, Marcia Bourne, Ann Burns, Maricris Candelaria, Arthur Candia, Josie Clarke, Nan Connolly, Zenaida Cortez, Ana Cosgaya, Walton & June Dickhoff, Sandra & William Dill, Carl Edwards, Joyce Flax, Adela Florez, Henry Fosson, Jesse Grube, Gladys Haff, Denise Hawald, Joanne Johnson, Koret Koelman, Muriel Krause, Shirley Latham, Josephine Lavoie, Greg Lille, Marky, Daniel McHale, Rosemary McHale, Terry McLeod, Sal Milizio, James Morrisey, Thomas O'Brien, Jim Olmo, Louis Ricardo, Bill Reilly, Doris Ross, Pauline Speranza, Don Vickery, Jennifer Westbrook & Frank Wright. Please extend my sincere thanks to your parishioners for their generous response of $2,450 to the special Earthquake Relief collection. Their financial assistance to this special appeal, as well as their prayers, will undoubtedly be a source of encouragement and hope for those whose lives were disrupted and affected by the recent earthquake in Mexico. All are invited to participate in the three Lenten disciplines: PRAYER, FASTING and ALMSGIVING, each Friday during Lent (except on Good Friday). Stations are held in our Church at 6 PM, followed by a light Lenten Supper in Hennessy Hall. The supper on March 21st will be hosted by the Women's Guild. We ask that you donate what you would normally spend on Friday dinner to our St. Vincent de Paul Society by placing it in the basket on the serving table. They will use your gift to help our sisters and brothers in need. If you are a newcomer, this is a good way to meet and get to know other members of our parish family. All are welcome! Sunday, March 165th, at 11:30a.m. Congratulations to all the boys and girls basketball teams for a great season. Special congratulations to the 8th grade Varsity Boys and Girls, the 8th grade Girls Sharks, the 7th grade Girls JV's and the 7th grade Girls Sharks for making the playoffs. Super special congratulations to the 8th grade Boys Shark team for winning the PPSL North Championship. The boys will be playing for the the North/South championship this weekend. A Sports Mass will be held March 30th at 9:30 a.m. All players should wear there St. Roberts warm up top or jersey and should meet at 9:15 a.m. in front of the Church. We would appreciate 100% participation. If you have any questions please contact Steve Belluomini. April, 7th-Monthly meeting Hennessy Hall. Doors open 6:30 p.m. All men of the parish are welcomed. For resesrvations call 227-8869. In July the Archdiocese of San Francisco will be celebrating it's 150th Anniversary. Hopefully, you've taken the opportunity to read the wonderful historical articles in the San Francisco Catholic. For our part, there will be historical articles about St. Roberts in the next issue of Across the Parish. please notice the beautiful banner and posters in the back of Church.